I have decided that as a new series of blogs, it would be interesting to write about what I got up to in the month just gone, and so I am starting today with what we did here at Jack Baker Art in the month of June. First of all I want to say that this is helpful for me because it means I can track our progress. Our successes and our failures (believe me, there are quite a few). I also hope over time I may gain more support from you in the way of comments of encouragement or advice on where to take our adventure next. June has been a a whirlwind of a month. It was one hell of a ride and I enjoyed every second of it. It was a milestone month for us here at Jack Baker Art, and one to remember. So much has happened over the space of a month and we are incredibly excited to see how things move forwards. Because there was so much that happened I'm going to break it down for you in just a second. Before I do that, I just wanted to give a special thanks to the people who support me to continue doing what I do. My wife, of course, is my biggest support and inspiration in all of this. She works with me tirelessly covering the admin side of the business, including emails, marketing, customer service and order fulfilment. So if you have an queries you will be dealing with her - don't worry she's lovely! So thank you! Next up are my followers, who without their love and support I would be having a much harder time doing this. It is your encouragement that helps me to strive forwards to be a better artist and to create the work that I love. The first thing to mention for June was the launch of our new website (if you hadn't realised you are here) and web store. We have worked very hard to get to a point where we are able to have a place to display my work, have a news outlet/blog and a web store for my fantasy art prints and merchandise. I am still keeping my Jack Baker Design website as my portfolio site for the time being, which I send out to potential clients. But Jack Baker Art is the brand we want to go forwards with to follow my personal projects, the current being my series of fantasy women. Jack Baker Art is a joint effort between my wife, Elise, and I. So like I said, June has been a very busy month. Alongside the website launch, I have created a lot of paintings. With my wife on board I now have more time to paint, which means more digital paintings for you guys to see. During the month of June I created 2 new paintings for the series of fantasy women, Kennis and Abuto, as well as my usual work load of client pieces. I completed 2 book covers as well as doing 26 sketches for a book interior. At the time it didn't feel like a great deal, but now that I look back that is a huge amount of work! And damn I am proud of that. If you didn't know, my wife and I, as well as a few of our friends, are big Magic: The Gathering fans. We host Friday Night Magic at our house every Friday with a friend or two as a nice escape from day to day life. 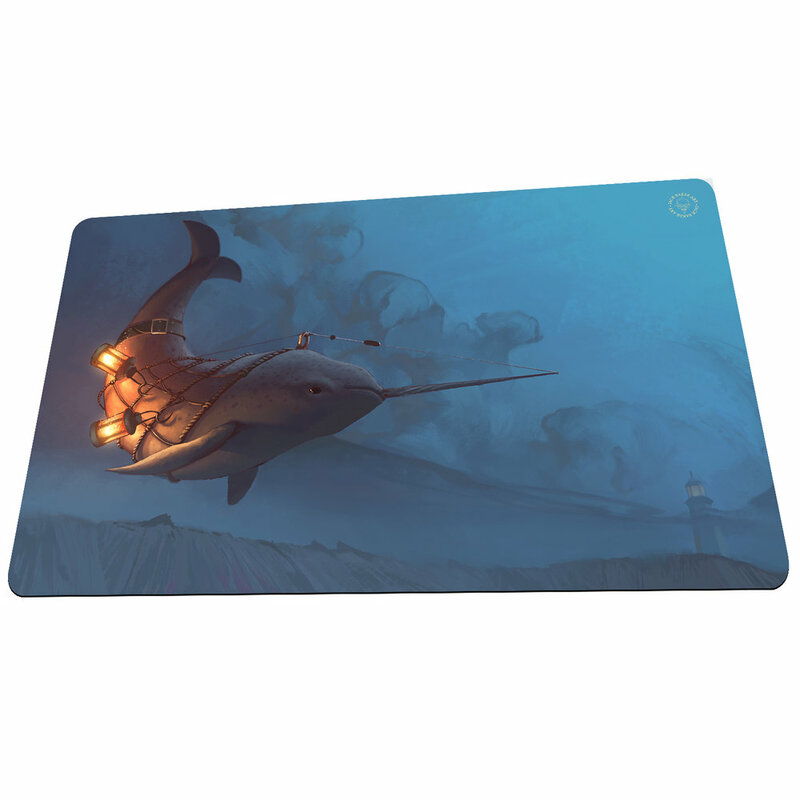 So it only made sense that we used my artwork to create our own custom MTG playmats. We spent quite a bit of time sourcing a great supplier, and in the end we got lucky and found a really great play mat supplier here in the UK. All the others were overseas. So we now have products in the shop that I am hugely proud of. These things look absolutely amazing! Indigo, our beautiful, creative, amazing daughter is due to start going to school in September, and it has all become quite an ordeal. For months she has been very excited about going to "big school" and "making lots of new friends". However I think the reality of it has hit her now, and she has become quite anxious about the whole thing. I can't blame her, I hated school. In June the school started 'taster sessions' for the children moving up to reception. This was an opportunity for the children to get used to the new environment, meet their teachers as well as their classmates. Also an opportunity for us to as well. As soon as we walked into the school her whole attitude changed and she seemed very withdrawn. Since then we have had endless tantrums, bad behaviour and sleepless nights. They go to the school for an hour every Wednesday, and she seems to play up the worst the day before through to the day after. It has become pretty tiresome, understandably, but we are doing our best not to let it have an effect on the business! I am sure she will get used to it. She's a very bright kid, and very creative too. She even says she wants to work with me when she is older, bless. So, whatever the outcome of school she will always have a job to go to! She already helps me out around the studio when she can! Above is Indigo helping me get ready to take some product photos. This is us setting up the photo booth (I know, very ghetto) and aligning the camera. She found it all very exciting! July is already looking to be an exciting month. I have some cool projects to work on, both personal and client stuff, that I'm really excited about. And some more exciting content that I can't wait to show you. We plan to continue keeping up with social media, blogging and creating more awesome paintings. If you want to keep up with all of that, signing up to our newsletter is the best way to do. And in doing so you get access to all sorts of awesome offers, content and deals.